I really wanted to include this classic recipe, for Pommes (Potatoes) Anna, in my potato love entry, but it just missed the cut. Besides, it gave me a chance to actually make it (which I did, a few days ago) and take a photo. It is definitely one of my favorite potato dishes, but I don’t make it as often as the top three, because it does take some time to assemble. Well..not that much time actually, if you have a food processor to rapidly slice the potatoes. If you have to slice by hand, it will take a bit longer. 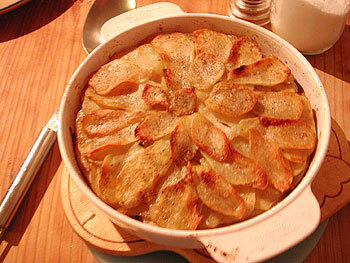 There are a couple of tricks to a successful Pommes Anna. First, select a “waxy” type of potato, not a floury type such as Idaho baking potato. I used a type called Nicola for this one. Second, you must slice the potatoes as thinly as possible. This is where a food processor really comes in handy. You could also use a mandoline, or one of those slicing/cutting thingies that used to be advertised quite a lot in informercials. I just use the trusty food processor. There are recipes for making this on the stovetop, but I like to make it in the oven, baking for a fairly long time until the top is crispy yet the inside is soft and amazingly creamy. I also don’t add any other flavoring other than salt and black pepper. This is a dish for really savoring the flavor of potato, with butter. And yes, this uses tons of butter, so is not for any weight loss diet. No, you cannot substitute any other kind of fat. Peel and slice the potatoes as thinly as possible. Do not put the slices in water, since the starch on the slices is what makes the whole thing stick together. Make ready a heavy oven-proof dish. A cast iron frying pan that you can put in the oven will do also. Brush the inside of the pan with butter. Put in a layer of potato slices, then brush with butter. Sprinkle on a bit of salt and pepper. Continue this, layer by layer, pressing down each layer of slices firmly with a spatula. To make it pretty, you may want to reserve some uniform slices to fan out into a nice design on top. When you’re finished, brush again with butter and salt and pepper. If you are being really indulgent you can pour on any remaining melted butter you have. Bake for at least 1 hour, until the top is golden brown and crispy. Serves 4 people as a side dish, 2 people just on its own with maybe a green salad to make you feel less guilty. Submitted by maki on 2004-04-30 15:39.
can you also include instructions for stovetop cooking? i only have an oven toaster at home. hi maki, what other types of potatoes are waxy besides Nicola? thanks! Jun, a potato that is for boiling, rather than baking, should be ok. In the US I think I'd use Yukon Gold. Jenny, for stovetop cooking, you'd layer and press the potato slices in a heavy frying pan (a cast iron pan is ideal) with rather more butter on the bottom. Then, cook it rather slowly, until the bottom is all crunchy. Turn it out upside down to serve/eat. It's a bit different from the oven kind but just as good! >>And yes, this uses tons of butter, so is not for any weight loss diet. No, you cannot substitute any other kind of fat. Thank you! So many people don't understand that there really is nothing like butter when it comes to cooking certain things. Is that a Kartoffel-Gratin? It's one of my favorite dish. I just a Mauviel pommes anna pan and have not used it as of yet. Do you think the combination of stove top browning and then oven baking is the best way to prepare this dish?